Caesars Palace is the world’s best known resort-casino, celebrating the grandeur that was Rome, in an 85-acre destination location that sets the standard for entertainment, dining and luxury. Reigning at the heart of the Las Vegas Strip, Caesars Palace ranks among the world’s top luxury resorts known for its originality and beauty. The resort features 3,960 hotel guest rooms and suites, 25 diverse restaurants and cafes, five-acre Garden of the Gods pools and gardens, 50,000 square foot QUA Baths & Spa and 300,000 square feet of premium meeting and convention space. The 4,300-seat Colosseum sits just steps from celebrity chef restaurants and the acclaimed Forum Shops at Caesars. 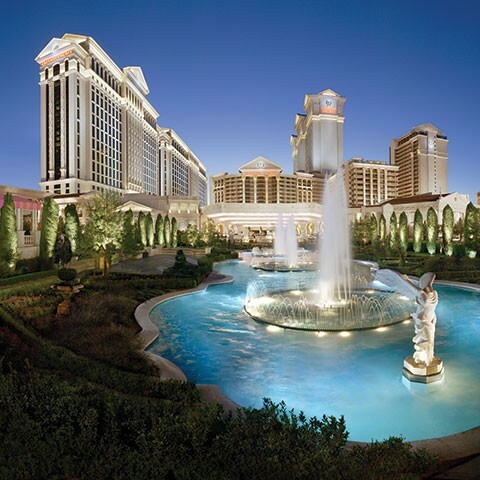 Caesars Palace brings you all the excitement of a Las Vegas casino in an ancient Roman setting. Enjoy your lavish surroundings while playing your favorite slots and table games—including blackjack and poker—or take your chances at the race and sports book. Whether you’re looking to win big or simply in it for the experience, Caesars Place always offers something fun to play.